What technical protocols are projects using to share their resource? and how are they planning on representing their resources in Jorum? This is a post in the UKOER 2 technical synthesis series. 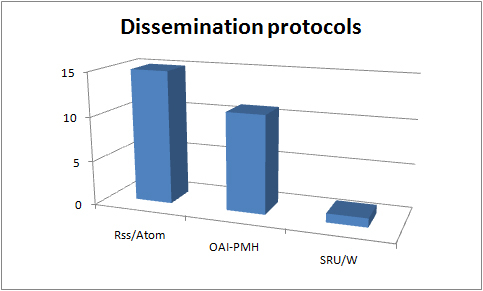 The chosen dissemination protocols are usually already built in the platforms in use by projects; adding or customising an RSS feed is possible but often intricate and adding an OAI-PMH feed is likely to require substantial technical development. DelOREs investigated existing OAI-PMH plugins for WordPress they could use but didn’t find anything usable within their project. 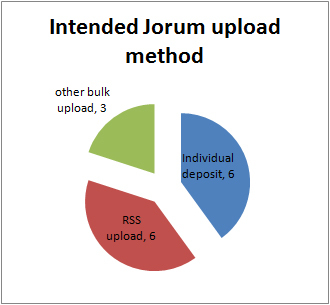 The statistics on Jorum upload method are denoted expressions of intent – projects and Jorum are still working through these options. Currently RSS upload to Jorum (along with all other forms of bulk upload) is set up to create a metadata record not deposit content. Three of the uploaders using RSS are using the edshare/eprints platform (this platform was successfully configured to deposit metadata in bulk via RSS into Jorum in UKOER phase 1). This entry was posted in Jorum, metadata / digitial repositories, OAI-ORE, OAI-PMH, oer, rss, rss_atom, Standards, ukoer. Bookmark the permalink. OAI-PMH feeds have indeed been successfully harvested into the NDLR test server from both the Leeds Met Repository and the NHS repository (both intraLibrary) and we have also been able to deposit into the NDLR via SWORD. Obviously a decision for Mimas but I hope SWORD deposit into Jorum may yet be on the agenda and shouldn’t be too difficult from a technical point of view though I think there are issues around authentication via UKFed. Hi Nick, thanks for commenting I knew this work was ongoing but didn’t have a link to hand – I’ll add the link into the post.